The 2014 New Quilt Blogger Blog Hop (hosted by the lovely Beth at Plum and June) is about to start and I am so excited to be a part of it. I do not make an appearance until July 16, but make sure you follow along and encourage all those other new bloggers out there. And if you have any suggestions for how I could improve my blog, or things you would love to see, please let me know. Thank you to all of those who have been excited with my about my upcoming trip to visit my family in the UK. We leave on Friday, so things are likely to be quiet around here for a little while as I enjoy the precious time we have together. I will have a few sneak peaks to show you though, including the Madhuri quilt I have made for my parents, and a mini quilt I am making for the Schnitzel and Boo Mini quilt swap. I aways enjoy popping over to your blog, and can't think of any improvements. You must be so looking forward to getting on the plane on Friday. Have a wonderful wonderful trip! 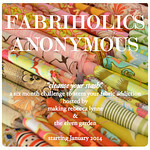 Looking forward to your blog hop entry, Deborah. Have a wonderful holiday! Hi Deborah, I hope you are having a wonderful holiday with your family over here in the UK. Enjoy! Hi Deborah, Nice to meet you! Your quilts are lovely. Hard to believe you've been quilting for such a short time! Your "Memories of India" quilt is very special; what a nice gift for your parents.